به منظور بهبود نگرش مشتریان و وفاداری آنان لازم است تا مؤلفه‌ها و باورهای برجسته، کلیدی وتأثیرگذاربر نگرش مشتریان نسبت به تبلیغات تلویزیونی شناسایی شودتابتواندربرنامه‌ریزی‌ها،آنهارامدنظر قرارداد. با توجّه به اهمیت این موضوع، پژوهش حاضر با هدف ارزیابی باورهای کلیدی مؤثر بر نگرش مشتریان نسبت به تبلیغات تلویزیونی و تأثیر آن بر وفاداری آنها به مجتمع‌های تجاری در کشور انجام شده است. این پژوهش از نظر هدف، کاربردی و بر اساس روش گردآوری داده‌ها، توصیفی محسوب می‌شود. به منظور جمع‌آوری داده‌های مورد نیاز از پرسشنامه استفاده شده است. پژوهشگران ضمن مرور مبانی نظری و با انتخاب اعضای نمونه آماری از میان مشتریان مجتمع‌ های تجاری شهر تهران که سریال پایتخت 3 را مشاهده کرده‌اند، فرضیه‌های پژوهش را با استفاده از روش مدل‌یابی معادلات ساختاری (SEM) و رگرسیون مورد سنجش قرار دادند. یافته ‌ها حاکی از تأثیر معنادار متغیرهای سرگرمی، معتبر بودن، اطلاع‌دهنده بودن و تعداد تکرار تبلیغ بر متغیر نگرش مشتریان نسبت به تبلیغات تلویزیونی و تأثیر این متغیر، بر وفاداری مشتریان به مجتمع‌های تجاری بود، اما تأثیر متغیرهای نفع داشتن، فشار زمانی و مزاحمت بر متغیر نگرش مشتریان نسبت به تبلیغات تلویزیونی تجاری به تأیید نرسید. 2Associate prof. in Business Management, Tarbiat Modares Uni. 3Full prof. in Business Management, Tarbiat Modares Uni. In order to improve customer attitude and loyalty the key elements and beliefs affecting on customer attitudes toward TV advertising must be recognized, so that for planning, they will be considered. Given the importance of this issue this research was conducted. The study aimed to evaluate the key beliefs influencing customer attitudes toward TV advertising and its impact on their loyalty to the commercial complexes in the country. This study is an applied research, and is descriptive in the term of data collection way. A questionnaire was used to collect the required data. Researchers after reviewing the theoretical foundations and sampling from a population of commercial complexes practitioners in Tehran evaluated the hypotheses using structural equation modeling (SEM) and regression. The findings suggested a significant influence of variables entertainment, being credible and repeated ad. On customer attitudes toward TV advertising and the variable TV advertisement on customer loyalty. But the impact of variables consisting benefit, time pressure, and harassment on customer attitudes toward television advertisement not confirmed. خداداد حسینی، حمید؛ جعفرزاده کناری، مهدی و بخشی‌زاده، علیرضا. (1394). مطالعه ارزش ویژه برند از دیدگاه باورهای شکل‌دهنده نگرش مصرف‌کنندگان نسبت به تبلیغات از طریق ورزش (فوتبال). مطالعات مدیریت ورزشی. 28، صص 54-33. قلی‌زاده، زهرا و حیدرزاده، کامبیز. (1394). بررسی تأثیر عوامل زمینه‌ای بر اثربخشی جایگذاری برند در فیلم‌های سینمایی. 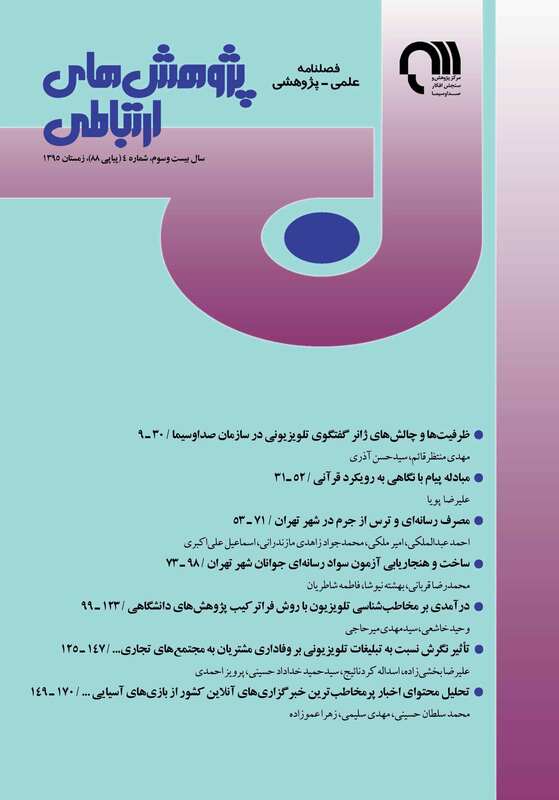 فصلنامه مدیریت بازرگانی، 7 (3)، صص 698-679. کردنائیج، اسدالله؛ بخشی‌زاده، علیرضا و ممبینی، حسین. (1395). بررسی عوامل مؤثر بر موفقیت مجتمع‌های تجاری. اولین کنفرانس بین‌المللی حسابداری و مدیریت در هزاره سوم، رشت: شرکت پیشگامان پژوهش‌های نوین. Alwitt, L. F. & Prabhaker, P. R. (1992). Functional and Beliefs Dimensions of Attitudes to Television Advertising: Implications for Copy testing. Journal of Advertising Research, Vol. 32, No. 5, Pp. 30 – 42. Alwitt, L.F. & Mitchell, A. (1985). Psychological Processes and Advertising Effect: Theory, Research, and Applications. Lawrence Erlbaum Associates, London. Andriasova, A. (2006). They Placed, I saw, I was Conquered: Evaluating the Effects of Persuasion Knowledge and Prominence of Brand Placement on Viewer’s Aattitudes and Behavior, Doctoral Dissertation, University of Texas, Austin. Appel, V. (1971). On Advertising wear out. Journal of Advertising Research, Vol. 11, No. 1, Pp. 11–13. Barbara, M. & Byrne, A. (2006). Structural Equation Modeling with AMOS: Basic Concepts, Applications and Programming, 2nd Edition. Barwise, P. & Strong, C. (2002). Permission-Based Mobile Advertising. Journal of Interactive Marketing, Vol. 16. No, 1, Pp. 14-25. Bauer, R.A. & Greyser, S. (1968). Advertising in America: the Consumer View. Boston: Harvard University Press. Cacioppo, T. & Petty, E. (1980). Persuasiveness of Communications is Affected by Exposure Frequency and Message Quality: a Theoretical and Empirical Analysis of Persisting Attitude Change. Current Issues and Research in Advertising, Vol. 3, Pp. 97–112. Fishbein, M. (1963). An Investigation of the Relationships between Beliefs about an Object and the Attitude Toward the Object. Human Relations, 16, Pp. 233–240. Goldsmith, RE. ; Lafferty, BA. & Newell, SJ. (2000). The Impact of Corporate Credibility and Celebrity Credibility on Consumer Reaction to Advertisements and Brands. Journal of Advertising, Vol. 29, No. 3, Pp. 43-54. Greyser, S. (1973). Irritation in Advertising. Journal of Advertising Research, Vol. 13, Iss. 1, p. 3. Johan, H.; Van, S.; Yvonne, K.; Saskia, B.; Henny, A. & Boshuizen, A. (2016). How Attitude Strength Biases Information Processing and Evaluation on the web, Computers in Human Behavior, 60, Pp. 245-252. Kirmani, A. (1997). Advertising Repetition as a Signal of Quality: if it’s Advertised so Much, Something must be Wrong. Journal ofAdvertising, Vol. 26, No. 3, Pp. 77–86. Kotler, P. & Keller, K. (2010). Marketing Management, 14 Edition, New York: Prentice Hall. Kotler, P. (2010). Marketing Management, 9 Edition, New York: Prentice Hall. Kruglanski, W. & Freund, T. (1983). The Freezing and Unfreezing of lay-Inferences: Effects of Impressional Primacy, Ethnic Stereotyping, and Numerical Anchoring. Journal of Experimental Social Psychology, 19, Pp. 448–468. Kuester, M. & Benkenstein, M. (2014). Turning Dissatisfied into Satisfied Customers: How Referral Reward Programs Affect the Referrer׳s Attitude & Loyalty Toward the Recommended Service Provider. Journal of Retailing and Consumer Services, Vol. 21, Issue 6, Pp. 897-904. Lundberg, U. (1993). Time Pressure and Stress in Human Judgment and Decision Making. Maule Journal of Svenson, Plenum, London, Pp. 41–53. Mackenzie, B. & Lutz, J. (1989). An Emprical Examiniation of the Structural Antecedents of Attitude Toward the ad in an Advertising pretesting Context. Journal of marketing,Vol. 53 , No. 2, Pp. 48-65. Park, T.; Shenoy, R. & Salvendy, G. (2008). Effective Advertising on Mobile Phones: a Literature Review and Presentation of Results from 53 Case Studies. Behavior and Information Technology,Vol. 27, No. 5, Pp. 355–373. Phau, I. & Teah, M. (2009). Young Consumer’s Motives for using SMS and Perceptions Towards SMS Advertising. International Journal of Direct Marketing, Vol. 3, No. 2, Pp. 97-108. Pollay, W. & Mittal, B. (1993). Here’s the Beef: Factors, Determinants, and Segments in Consumer Criticism of Advertising. Journal of Marketing, Vol. 57, No. 3, Pp. 99–114. Pyun, Y. & James, D. (2011). Attitude toward Advertising Through Sport: a Theoretical Framework, Sport Management Review, 14, Pp. 33– 41. Rahman, O.; Wong, K. & Yu, H. (2016). The Effects of Mall Personality and Fashion Orientation on Shopping Value and Mall Patronage Intension. Journal of Retail. Consume. Serv, Vol. 28, No. 1, Pp. 155–164. Rittippant, N.; Witthayawarakul, J.; Limpiti, P. & Lertdejdecha, N. (2009). Consumers’ Perception of the Effectiveness of Short Message Service (SMS) and Multimedia Message Service (MMS) as Marketing Tools, Proceedings of World Academy of Science, Engineering and Technology, 41, Pp.815-821. Schlosser, E.; Shavitt, S. & Kanfer, A. (1999). Survey of Internet Users’ Attitudes Toward Internet Advertising. Journal of Interactive Marketing, Vol. 13, No. 3, Pp. 34 –54. Srinivasan, S.; Anderson, R. & Ponnavolu, K. (2002). Customer Loyalty in E-commerce: an Exploration of its Antecedents and Consequences, Journal of Retailing, Vol. 78, Pp. 41-50.